It was finally here. I’d been waiting for this day for over a month. Actually, truthfully, I’d been waiting for it for years! It was the day the contractors would come and we would finally have three safe turnouts for the horses! We’ve been working for over a decade to get to this point … and still, it almost didn’t happen! 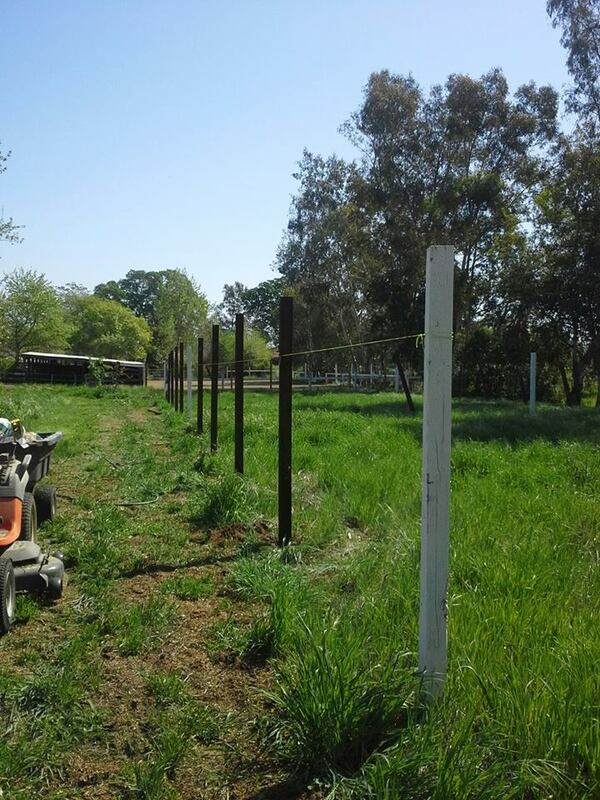 When we bought this place, there was nothing you could call horse-safe fencing. There was a turnout up front, but it’s just feet from a busy road, and it wasn’t long before I had kids teasing the horses and throwing rocks at them. No one liked being up there, and who could blame them? A young Tally on our back acre, eight years ago. The only other thing that passed for a turnout was the back acre. 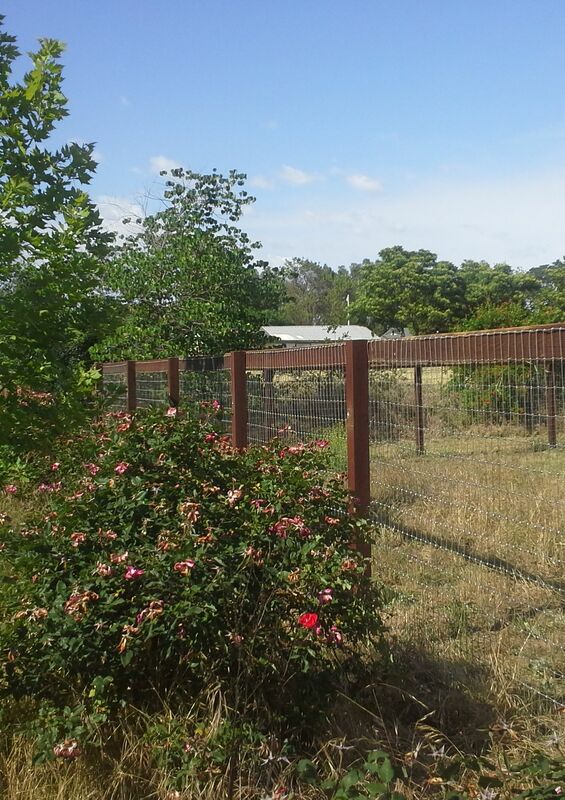 It is fenced in with old field fencing and barbed wire – a bad combination for horses! Tally did grow up back there, first with her mom and then with her “Auntie” Dani – both very savvy mares who preferred staying near the barn most of the time. The crew we have now – in particular Coffee and Noble – have little respect for fences. 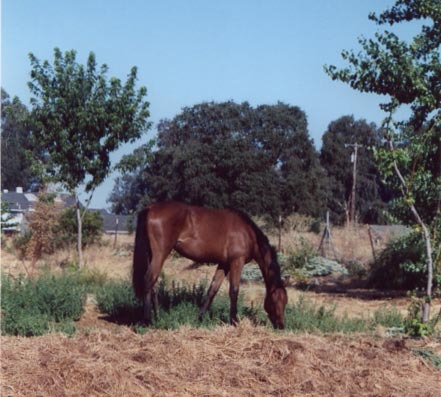 In fact, the first time Coffee was turned out near the perimeter fence, he leaned over it and was through in less than five minutes – and that was with knee deep grass on our side of the fence! Six or seven years ago, we began our valiant effort at building safe and suitable turnouts. A friendly neighbor brought his tractor and dug the holes for two turnouts. Two years later, and we finally had all of the posts in. Another year of trying to find a way to fence them in that was doable by two desk jockeys. We finally put up a single top rail, just to make them usable. That worked until the fence busters, Coffee and Noble, came along. We’re really good at posts, by now! After the first two were minimally fenced, our neighbor dug holes for a larger one. That was two years ago, and it was just last month that we got the last posts put up. By now, both Coffee and Noble had taken turns busting out of the two turnouts we already had. 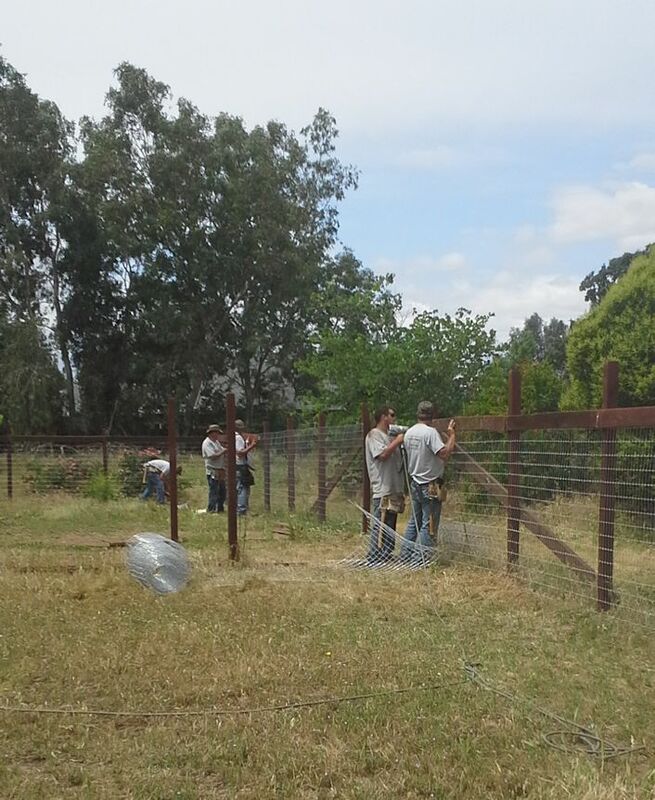 We started the process of stretching and putting up no-climb wire fencing – after two sides of the smaller turnout, it was clear this was more work than we had time or strength for. There were offers from friends to help out – but we’re not talking about a bunch of burly guys. Help would be welcome, but it was clear that it would still take lengthy time and strength we weren’t sure we had. Besides, our friends had their own projects to take care of. So, after much soul searching and money counting, we decided to make the plunge and hire professionals to finish what we’d begun. Best decision ever! After weeks of waiting, between estimate and actual work, I was so excited when the day came. Imagine my disappointment when I awoke to rain! In this fourth year of drought, where rainy days are so very rare, the first day of our job just had to be one of them! I love the rain … but I wanted my fence! Fortunately (for my purposes) the rain was short lived, and they started midday. It was a wonder to see these guys work! In half a day they completed what would have taken us weeks! By the end of day two, it was all done – two small and one medium turnout! 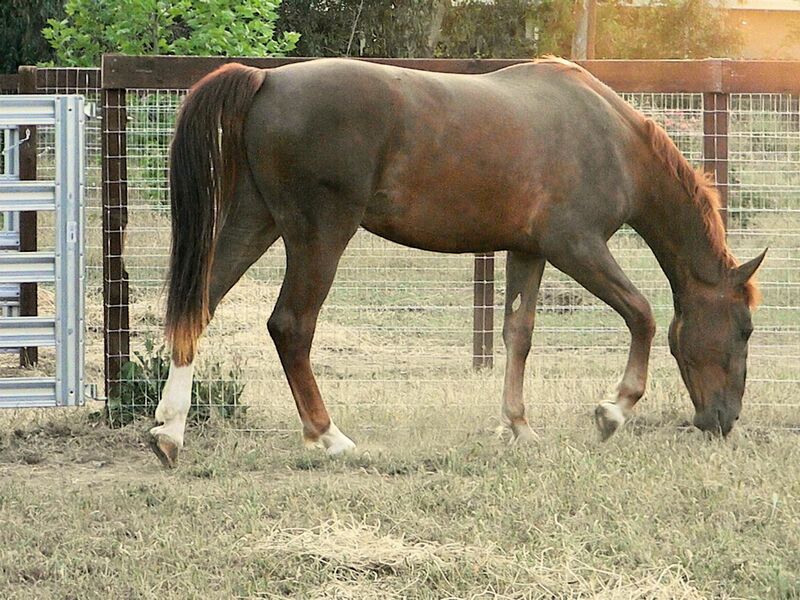 Noble checking out the new fence line. We wasted little time in making use of the lovely, safe, new turnouts. Noble, expecting the same “push-over” fencing, seemed a little angry that he couldn’t reach over or under the fence. Coffee shared his frustration at the change – but all of that changed when each got a turn at the larger turnout – plenty of room for some nice gallops! More than anything, it feels good that we can leave them out there with no worries about roaming dogs getting in and creating a disaster. Our latest resident, Charles, on his favorite human viewing perch. 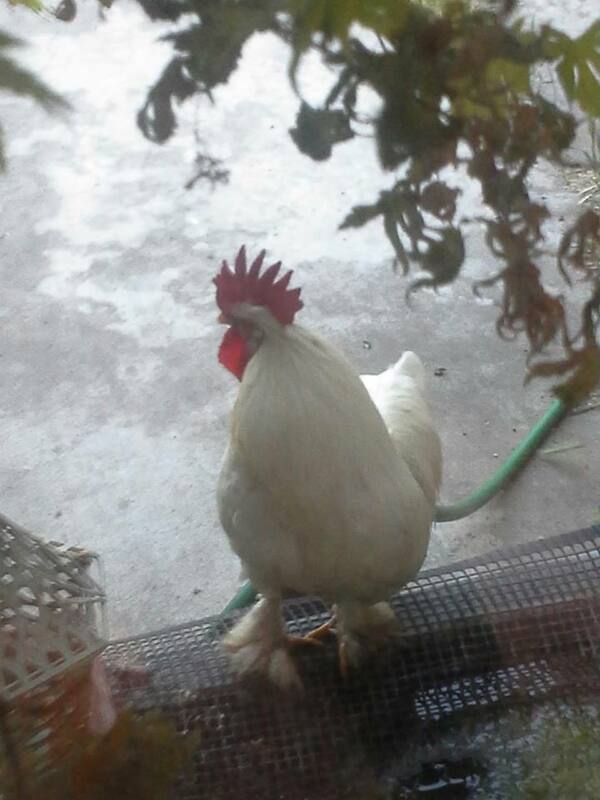 Amid the days of fence building, we were amused by our latest resident – Charles the rooster. Charles showed up, literally, on our doorstep almost two weeks ago. He found the spilled seed, from our bird feeder, and the water in our small fish ponds. Enough to make a home for a rooster, apparently. Charles was clearly raised by hand – he is not only unafraid of humans, he follows us everywhere we go. Up the driveway, when my mother gets the paper; and now, down the other driveway when we head to the barn. When we come back to the house, so does Charles. Ever tried living like a zoo animal or aquarium fish? Every time we turn around, there’s Charles, watching us through the living room window! With the contractor trucks in and out, we were busy keeping track of Charles. He’s a little too fearless for his own good, and in a truck-vs-rooster match, he would not come out well! 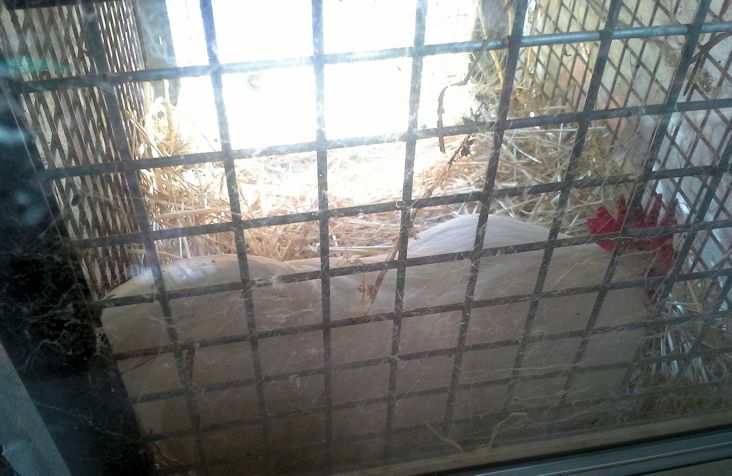 We’ve also been concerned about his safety at night, having already lost two hens to racoons (and they were in a coop!). Lacking a safe pen, we set up a cage on the front porch, just for nights. We made sure to place it so he could continue his people watching. The first night, I picked him up and placed him in it. If it bothered him too much, he might move on the next day. Ha! Charles napping in his new “house”. The next day, Charles popped up into the cage every time he felt like a nap. You could hear him, next to the window, making his little sleepy cackles. Truly a crazy bird! Our next project will be to build him his own home, and get him some girlfriends. Our other hens are on the retirement plan, so it’s time for new layers anyway. Welcome home, Charles! Now, off to make more use of those turnouts! This entry was posted in My Journey and tagged barbed wire, Charles, Coffee, contractors, crazy bird, dog proof, fencing, new resident, Noble, rooster, safety, turnouts. Bookmark the permalink. 1 Response to Fence Day! Sweet! !!! So happy for you. Yey, turnouts!